Lately, whenever I've been out for breakfast or brunch, I've been religiously ordering granola. And this isn't because of my lack of vegetarian options! I've had some damn fine granolas during these past few months, and some pretty average ones. Since moving into my new apartment, attempting to create a 'home' for myself, I've been getting back into my love of cooking. There's something very satisfying about cooking a meal for yourself and loved ones! That, and the fact that everything on offer at the supermarket is full of sugar, is what inspired me to make my very own granola. Here's my adapted version of the ever inspiring Juliette of Luar and Wolffdene's Fig, Almond and Maple Granola, based on what I had in my pantry. Get that oven warmed to 170 degrees Celsius, and place baking paper on a large baking tray. Get your ingredients prepped – chop those almonds, melt that coconut oil. Now we're ready to get cooking! In a large mixing bowl, combine all the dry ingredients (not including the dried cranberries), and mix well. Add in the melted coconut oil and maple syrup. Combine so everything is oozing with that delicious coconut and maple goodness. 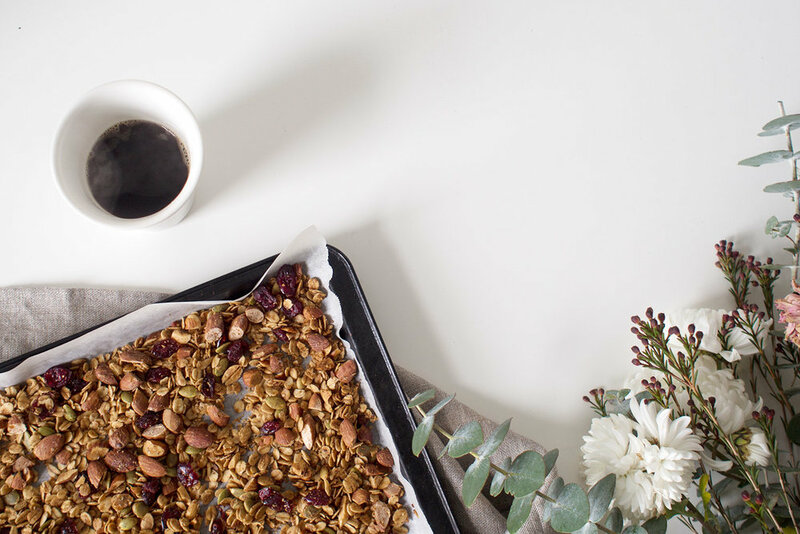 Evenly spread the granola onto the baking try and place into the oven for 25 – 30 minutes. Stir the granola every 10 – 15 minutes to ensure the granola is evenly toasted. Once the granola is nicely toasted, stir through the cranberries. Hold back on tasting, it's extremely hot (I learned this from experience). Allow the granola to cool completely before transferring into an air-tight container or jar. * N.B. Feel free to change the nuts and fruit in this recipe. Brunch is huge in Melbourne! In fact, most cafes will do all day breakfast to cater for our brunch loving citizens. What about your home town?